In the world of Oscar, comedies get no respect. Maybe this year, things might change. The Devil Wears Prada, the laugh out loud funny movie based on the book by Lauren Weisberger, deserves a look from the Academy. With crisp, funny dialogue and well-drawn, endearing characters, Prada is easily one on the funniest movies of the year. Most responsible for the film's success is its star Meryl Streep. Nominated for thirteen Oscars and winner of two for Kramer v. Kramer and Sophie's Choice, Streep is known for her dramatic roles. 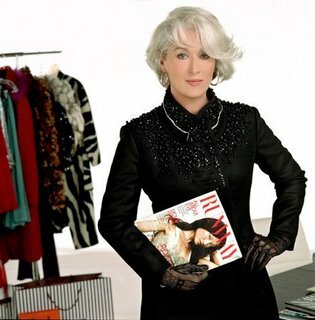 In Prada she is Miranda Priestly, the pajandrum of New York fashion, editing the influential magazine Amercan Runway. She is cruel and manipulative, cold and heartless, and based on Anna Wintour, the nearly omnipotent editor of Vogue. Streep's subtle performance is never over the top, and she finds a way to humanize Priestly so that the audience does not come to loathe the editor to the point of disinterest. Stanley Tucci adds another layer of brilliance to Prada. As Nigel, he plays fairy godmother to Anne Hathaway's Andy Sachs. Hired as the second assistant to Miranda Priestly, Andy has no interest in fashion, and her wardrobe shows it. Surrounded by the beautiful and anorexic, Andy , with Nigels help and a pair of Channel boots, she finally embraces the fashion world she now inhabits. Much to the chagrin of her old friends. For Hathaway, the transformation is a reprise of her Princess Diaries role but all grown up. Not only is there brilliant acting, high fashion, and pithy one liners, but there is a story worthy of the $10 ticket price. Go see The Devil Wears Prada and laugh like you're all alone.